Written by goenKendama on May 26, 2014 . Your physical size and age can make a difference. So can your athleticism more specifically hand-eye coordination. We’ve seen little kids that could handle a regular kendama with ease and sporty adults that really had to work at it but we’ve seen the inverse as well. While the length of the string can be shortened the weight and size of the ken and tama can’t be changed easily. 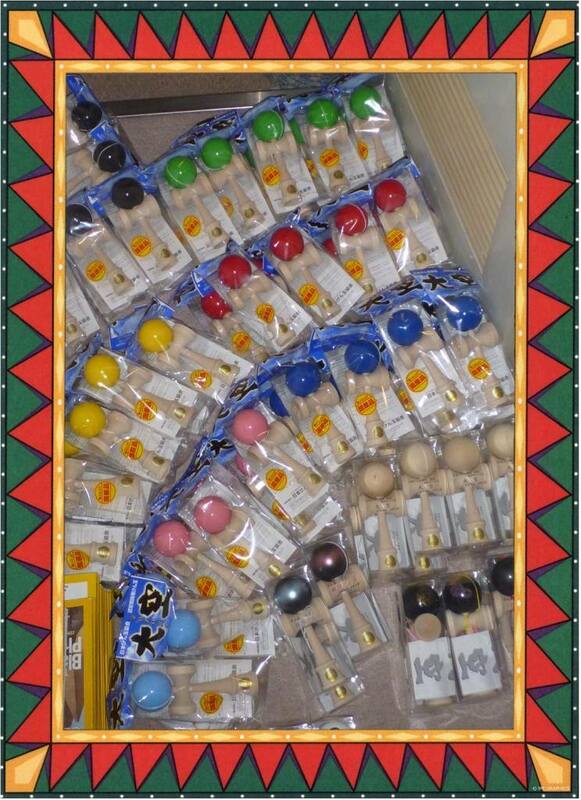 If you are younger or you are a bit on the small side consider starting with a Shokendama (several colors available) or Hajimete no Kendama first. Its light weight, standard size cups, and smaller ball will make it a bit easier with which to learn. As you practice and become better you can always step up to a full size kendama. If you are unsure which size to get feel free to talk with our staff for suggestions or better yet come try out the different sizes at our shop. It’s kind of like buying a pair of shoes; find one that fits you and your playing style and you’ll be happier in the long run. If you really want to learn how to play, understand that you will drop and generally knock around your new kendama. It will get dents and scratches and on occasion even chip the paint. Don’t worry about that at all, it’s part of the breaking-in process and in most cases will actually make your kendama play better. With this in mind you would probably be best served by getting a basic model rather than a Limited Edition/Special Edition (LE/SE). The Ozora dragon, snake, or cherry blossom models look great but you might be tempted to worry about damaging them. We’ve had customers who bought one of those for their first kendama only to come back to the shop often just to play our test models because they thought theirs was too pretty to play. Some of our customers split the difference and get one of the Ozora Galaxy models first. They’re a bit less expensive than our LE/SE models but they still look different than our base models; a little guilt-free glamour. You can also add a little individuality by simply changing the string color. You’d be surprised how that one small change can add a personal touch to your kendama. Many of our kendama feature a beech ken and a cherry tama so the main difference in how they play will be the paint, or lack thereof, on the tama. Different paint or no paint will take different amounts of time to break-in and once broken-in will play slightly differently. (Although most kendama come with a glossy or semi-glossy paint there are some models that will have a “sticky” paint, one that feels a bit tacky when playing. Some of those too will require breaking in.) Understand that in most cases your first experiences will make you feel like the tama is very slippery; that’s just part of the process. As the tama gets broken-in and your skill increases it will become easier to play. So now you’ve gotten your first kendama. What’s next? Check out our other articles: What to do with your new kendama and Start Playing: an intro to kendama play.